What's Eating Gilbert Grape is a 1993 American drama film directed by Lasse Hallström and starring Johnny Depp, Juliette Lewis, Darlene Cates, and Leonardo DiCaprio. The film follows 24-year-old Gilbert (Depp), a grocery store clerk caring for his morbidly obese mother (Cates) and his mentally impaired younger brother (DiCaprio) in a sleepy Midwestern town. Peter Hedges wrote the screenplay, adapted from his 1971 novel of the same name. The film was well-received; DiCaprio received his first Academy Award nomination for his role. In the small town of Endora, Iowa, Gilbert Grape (Johnny Depp) is busy caring for Arnie (Leonardo DiCaprio), his mentally challenged brother, as they wait for the many tourists' trailers to pass through town during an annual Airstreamers' Club gathering at a nearby recreational area. His father had hanged himself seven years earlier, and since then his mother, Bonnie (Darlene Cates), has spent most of her days on the couch watching TV and eating. With Bonnie unable to care for her children on her own due to her morbid obesity, Gilbert has taken responsibility for repairing the old house and looking after Arnie, who has a habit of climbing the town water tower, while his sisters Amy (Laura Harrington) and Ellen (Mary Kate Schellhardt) do the rest. The relationship between the brothers is of both care and protection, as Gilbert continually enforces the "nobody touches Arnie" policy. A new FoodLand supermarket has opened, threatening the small Lamson's Grocery where Gilbert works. In addition, Gilbert is having an affair with a married woman, Betty Carver (Mary Steenburgen). The family is looking forward to Arnie's 18th birthday. A young woman named Becky (Juliette Lewis) and her grandmother are stuck in town when the International Harvester Travelall pulling their trailer breaks down. Gilbert's unusual life circumstances threaten to get in the way of their budding romance. In order to spend time with Becky to watch the sunset, Gilbert leaves Arnie alone in the bath. He returns home late and finds that Arnie is still in the bath the following morning, shivering in the (now cold) water; his guilt is compounded by his family's anger. His affair with Betty ends when she leaves town in search of a new life following her husband's death—he drowned in the family's wading pool after suffering a heart attack. Becky becomes close to both Gilbert and Arnie. While they are distracted during one of their talks, Arnie returns to the water tower that he is always trying to climb. Arnie is arrested after being rescued from the top of the tower, causing his mother—who has not left the house in seven years—to become the object of pointing, laughing, and gawking from the townspeople as she goes to the police station, forcing Arnie's release. Soon after, Arnie tries to run away yet again from his bath and in his frustration, Gilbert finally snaps, hitting Arnie several times. Guilty and appalled at himself, Gilbert runs out and drives away in his truck without another word. Arnie also runs out and goes to Becky's, who takes care of him for the evening until he is picked up by his sisters. After some soul searching aided by Becky, Gilbert returns home during the birthday party to make amends to his family for running out and to be forgiven by Arnie which, with only the slightest hesitation, he is. He apologizes to his mother for his behavior and promises that he is not ashamed of her and that he will not let her be hurt any more. She admits to Gilbert her knowledge of what a burden she has become to the family, and he forgives her. He introduces her to Becky—something he had been reluctant to do earlier. Following Arnie's 18th birthday party, Bonnie climbs the stairs to her bedroom for the first time since her husband's suicide. Arnie later tries to wake her but discovers that she has died. The children, not willing to let their mother become the joke of the town by having her corpse lifted from the house by crane, empty their family home of possessions and set it on fire. A year later, Gilbert describes what happened to his family after his mother's death, as Gilbert and his brother Arnie wait by the side of a road for Becky, who arrives with her grandmother, and picks them up. What's Eating Gilbert Grape was shot in Texas, in various towns and cities; Austin and Pflugerville were primary locations, as well as Manor, where the water tower featured in the film was located. I had to really research and get into the mind of somebody with a disability like that. So I spent a few days at a home for mentally retarded teens. We just talked and I watched their mannerisms. People have these expectations that mentally retarded children are really crazy, but it's not so. It's refreshing to see them because everything's so new to them. The film had a limited release on December 17, 1993 and wide release on March 4, 1994. The wide release garnered $2,104,938 on its first weekend. Total domestic gross for the film was $10,032,765. The film received positive reviews from critics. On Rotten Tomatoes, the film was given an 89% "Certified Fresh" score and an average rating of 7.3/10 based on 45 reviews. The site's consensus states that the film is "sentimental and somewhat predictable, but those are small complaints, given the tender atmosphere and moving performances at the heart of What's Eating Gilbert Grape." The New York Times film critic Janet Maslin praised DiCaprio's performance, writing "the film's real show-stopping turn comes from Mr. DiCaprio, who makes Arnie's many tics so startling and vivid that at first he is difficult to watch… The performance has a sharp, desperate intensity from beginning to end." Roger Ebert of Chicago Sun-Times described it as "… one of the most enchanting films of the year" and said that DiCaprio deserved to win the Academy Award for Best Supporting Actor for which he was nominated. Todd McCarthy of Variety found the film a "bemused view on life" and remarked that "Depp manages to command center screen with a greatly affable, appealing characterization." The Washington Post's Desson Howe thought the film was an earnest but highly predictable effort. Film Review praised Leonardo DiCaprio as the mentally handicapped brother, calling it "a performance of astonishing innocence and spontaneity", bringing "a touching credibility to a very difficult part". ^ "What's Eating Gilbert Grape - Box Office Data". The Numbers. Retrieved 2011-07-28. ^ "What's Eating Gilbert Grape (1993)". Box Office Mojo. Retrieved 2011-07-23. ^ What's Eating Gilbert Grape (film). 1993. p. 1 hour 11 minutes. ^ Clinchy, Don (December 13, 2011). 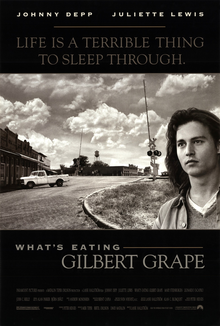 "Lone Star Cinema: What's Eating Gilbert Grape". Slackerwood. Retrieved January 11, 2016. ^ a b Cameron-Wilson, James; Speed, F. Maurice (1994). Film Review 1994-5. Great Britain: Virgin Books. p. 148. ISBN 0-86369-842-5. ^ "What's Eating Gilbert Grape (1993) - Weekend Box Office Results". Box Office Mojo. Retrieved 2008-12-30. ^ "What's Eating Gilbert Grape (1993)". Box Office Mojo. Retrieved 2008-12-30. ^ "What's Eating Gilbert Grape Movie Reviews, Pictures - Rotten Tomatoes". Rotten Tomatoes. Retrieved 2008-12-30. ^ Maslin, Janet (1993-12-17). "Movie Review: What's Eating Gilbert Grape". The New York Times. Retrieved 2008-12-30. ^ Ebert, Roger (1994-03-04). "What's Eating Gilbert Grape". rogerebert.com. Retrieved 2008-12-30. ^ McCarthy, Todd (1993-12-06). "What's Eating Gilbert Grape Review". Variety. Retrieved 2008-12-30. ^ Howe, Desson (1994-03-04). "What's Eating Gilbert Grape". Washington Post. Retrieved 2008-12-30. Wikiquote has quotations related to: What's Eating Gilbert Grape?